The purpose of the strategies is to provide clear guidelines to taxonomic researchers as to where to direct research efforts and resources to maximise the benefits of research to society. The strategies also clarify the co-ordinating role with which SANBI is mandated. The list of plant genera prioritised for revision also provides the names of researchers currently working on those genera. Please help us to keep this list updated by sending comments, corrections or additional information to Janine Victor. Many taxonomists living and working outside of South Africa have made a significant contribution to taxonomy of the country’s flora. A register of taxonomists detailing families and/or genera in which they are conducting taxonomic research and country of residence, is provided below. Please send updates or additional information to Janine Victor, especially for specialists who have been inadvertently omitted from this list. 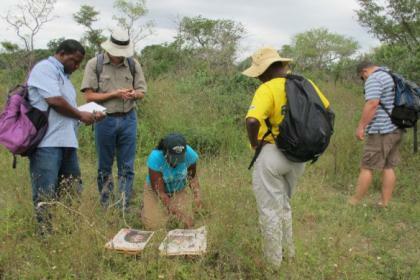 In addition this registry, along with the highlighted priority taxa for research, serves to co-ordinate taxonomic research of South Africa’s flora. We hope this will stimulate interest in taxonomic research on the country’s diverse flora amongst taxonomists abroad. For further information contact Shanelle Ribeiro.